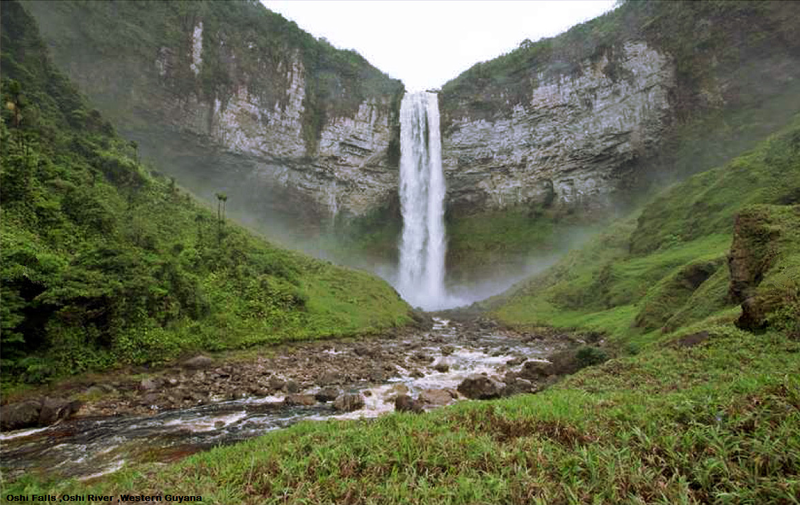 King George VI Falls, also known as Salto Oshi or Oshi Falls, is located on the Oshi River in western Guyana. This waterfall is rarely visited. Its height has not been reliably determined, but is believed to be between about 500 and 700 feet. Though it is not as tall as it has long been thought to be, its combination of height and great volume of water, along with its being a sheer plunge, make it one of the world's most impressive waterfalls. Most likely the first white man to reach this (and the nearby Kamarang Falls which have similar size) waterfall was the young American entomologist and physician Paul A. Zahl in 1938. Zahl wrote a book "To The Lost World", describing his adventures in the spectacular highlands of Guyana, Venezuela and Brazil. Later he became a prominent author, writing many articles to geography magazines and taking great pictures of the natural world. Height of this waterfall has often been reported to be 1,600 feet, and that figure has been published many times over several decades, but it is greatly exaggerated. The error originated from imprecise measurements of Paul A. Zahl who estimated the height of falls by throwing large rocks and counting seconds until the stones fell down. In 2014 a British television series set out to document the falls and fauna which existed around the location. The expedition recorded the falls at being over 200 meters tall. The Lost Worlds series will be broadcast in 2015 on the Discovery channel.